Born into a family of blacksmiths in Grodno, Russia (now Belarus) in 1896, Ossip Lubitch spent his teenage years in Odessa where he studied at the Fine Art Academy for four years. In 1919, he moved to Berlin with a group of Russian artists including Pavel Tchelitchev, Jean Pougny and Lazare Meerson, with whom he produced theatre and cinema sets. In 1923, after accepting a contract to decorate a Montmartre cabaret, he moved to Paris, where he studied the art of masters including Rembrandt, Goya and Degas, and was encouraged by the sculptor Antoine Bourdelle to pursue a career as a painter. In 1925 he was accepted into the Salon des Tuileries. In Montparnasse, Lubitch befriended Zygmund Schreter and the sculptors Irène Codreano and Léon Indenbaum, and composers and musicians from the music group Triton. During the Second World War, Lubitch continued painting in his studio Rue d'Odessa in Montmartre, but having failed to register with the police as a Jew, he was denounced in 1944 and arrested by the Gestapo, who sent him to Drancy. He managed to avoid the last convoy to Auschwitz, surviving the Holocaust and settling in Paris after the war. He bequeathed the drawings he produced in Drancy to the Yad Vashem Holocaust memorial in Jersualem in memory of the victims of the Holocaust and the Righteous among the Nations. After the Liberation, he met and married the painter Suzanne Boulboire, with whom he had a daughter. He died in Paris in 1990. 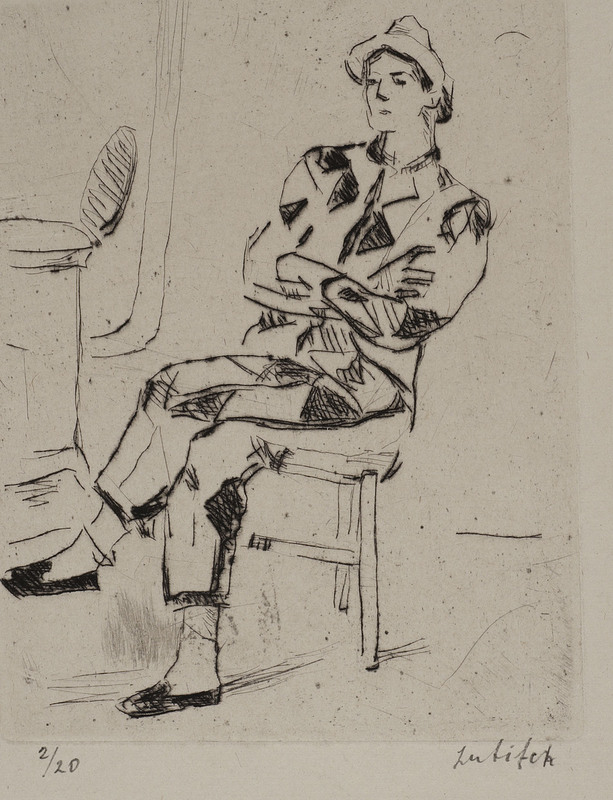 Lubitch's etchings of a seated and standing clown may belong to his 1934 album entitled Cirque, comprising ten etchings and aquatints of circus scenes with a poem preface by Georges Rouault.